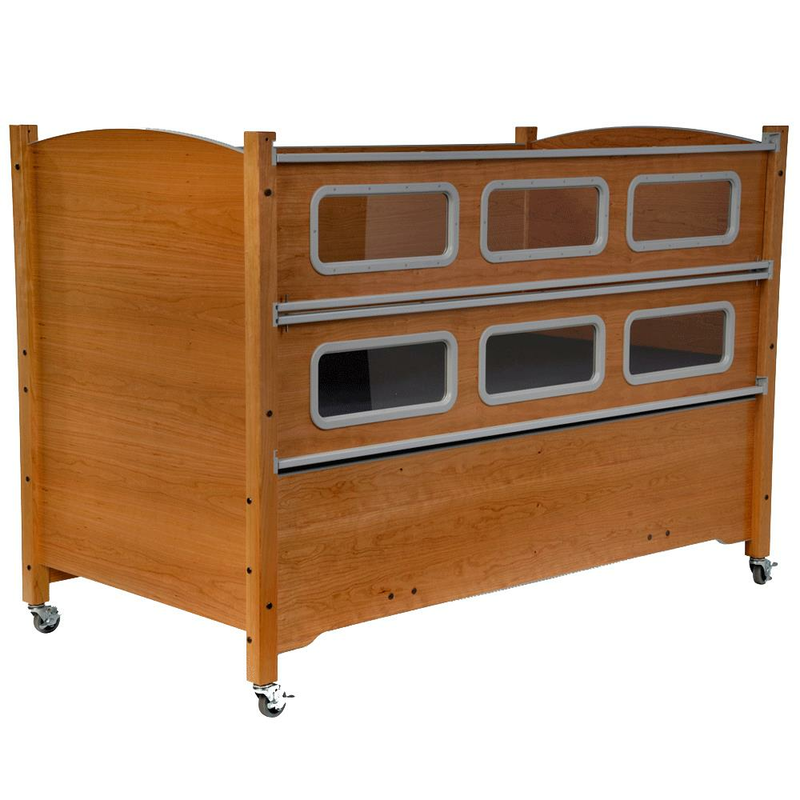 SleepSafer Tall Bed - Twin Size is an ideal choice for children or adults with cognitive or physical disabilities. It is designed for both children and adults who need the protection of full length safety rails. Sleepsafer features pressure reducing mattress with fluid-resistant, anti-microbial, anti-bacterial, fire-retardant stretch nylon fabric cover, easy-access safety rails and rail windows. The strong locking casters provide excellent mobility. Tall Bed transfer height is 26-inch with the safety rail on and 24-1/2-inch with safety rail off. Note: For Finish Choices view the Color Swatches. Buy this product and earn 315 Reward Dollars. - Twin Size is available with all available foundations. Mattresses support up to 350 lbs. - Mattress size is 38" by 77". - Fixed Foundation: Offers a foundation with a fixed height. The mattress will lie flat on a box spring or bunkie board. The height/positioning choice you make when installing the fixed foundation will determine the height of safety rail protection above the mattress. Example, if you choose to install at the lower position, this will increase the height of protection above the mattress. You may change the height of your fixed foundation at any time. Note: You have a choice when choosing the Fixed foundation of a box spring or bunkie board. There is no cost or comfort difference between the two options. The only difference in the two is the depth of each. A bunkie board offers approximately 5" more of safety rail protection. - Manual Foundation: Offers four choices. The hand cranks use a hydraulic system and are easy to use with little effort by the operating caregiver. The hand crank handles fold up into the shaft of handle. Manual Flat: Manual crank mattress height adjustment only. This will raise and lower the mattress height with one crank located in the front panel of the bed below the safety rail. Manual Plus: Manual crank head and knee adjustment. This will raise and lower the head and/or knee section of the bed with a combination of two cranks located in the front panel of the bed below the safety rail. Manual Electric: Manual crank mattress height adjustment and electric head and knee adjustment. This will allow user to raise and lower the head and/or knee section of the bed electrically with a remote. The raising and lowering of the mattress are controlled by a manual crank located in the front of the bed. Manual HiLo: Manual crank head, knee and mattress height adjustment. This will raise and lower the mattress height and raise and lower the head and knee section of the bed with a combination of three cranks located in the front panel of the bed below the safety rail. With a hydraulic system, the hand cranks are easy to use with minimal effort by the caregiver. - Plus Foundation: Electric head and knee adjustment. Offers an electric frame with a fixed height. This foundation features head and knee elevation by remote control. With the touch of a button, you can elevate the head and/or knee section of the bed. As in the Fixed foundation, there are more than one height positions to choose at time of installation. The height/positioning choice you make when installing this foundation will determine the height of safety rail protection above the mattress. Example, if you choose to install at the lower position, this will increase the height of protection above the mattress. You may change the height of your fixed foundation at any time. - HiLo Foundation: Electric head, knee and mattress height adjustment. Offers a Hi-Lo electric frame as your foundation with full articulation. Not only does the head and knee section elevate, but the Hi-Lo feature allows the mattress surface to be raised or lowered by remote control. This is considered a fully electric bed. Depending on where you position the mattress within the frame will determine the amount of safety rail protection above the mattress. When lowered all the way down you will maximize the rail height above the mattress. As you begin to raise the mattress from the floor, you will decrease that safety rail height above the mattress. With the Hi-Lo foundation, you can position the mattress anywhere within the range of motion of the frame. Important Note: The Hi-Lo electric foundation has a wired remote control on a cord plugged into the bed and does not operate more than one bed. No problem to have multiple beds in one space. The following wood choices are available for all SleepSafe Beds. SleepSafe beds are made with natural wood with a clear finish. Stain or paint are not used, allowing the natural beauty of the wood to shine through a protective clear finish. - Alder: It is a rustic birch with random knots and straight grain. It is moderately light with a clear, natural finish. - Maple: It is the lightest of wood choices and shows very little wood grain. - Oak: It is a bit darker than the maple, but relatively light in color and shows more natural wood grain. - Cherry: It is slightly darker than Maple and Oak but again, is still relatively light in color. Many people tend to think of the dark cherry stain when thinking of cherry, but remember this is the natural wood with no stain finish, however, over time, cherry wood will darken naturally over the years. - Mahogany: It should be the darkest of the wood choices but mahogany finishes will vary significantly. African Mahogany is used which is naturally lighter than typical dark Mahogany. The color will darken with time. Wood is clear coated to bring out the beautiful grain of wood. - Solid Color: It includes solid White, Blue, Green, Red, Yellow, Orange, Pink, Purple and Black. All leg posts are available in Maple only. - Padding: When ordering your bed, you will need to order your SleepSafe Bed with or without padding depending on your needs. Custom-fit padding provides protection from contact with the bed frame. The 3/4" high-density foam is covered with easy to clean waterproof nylon. It is important to make this determination when you order your bed as retrofitting your bed in the future will be costly. Cream color is standard. If you order padding, it will be installed at the factory and will cover all four sides. If you order padding with your bed, it is very important to never use the bed if you have removed one or more of the pads. If you remove any of the pads, a gap will be created between the mattress and the sides of the bed potentially creating a risk for entrapment. - IV Pole: It can be installed anywhere on the footboard or headboard. It is a 30 inch stainless steel pole with 2 ram hooks. - Headboard Window: It is available for installation in the headboard. - Footboard Window: It is available for installation in the footboard. Dual View Option:Dual View Safety Rails offer 2 additional safety rails, replacing the solid wood panel on the standard SleepSafer Tall bed, allowing access from both sides of the bed. 31" or 24-3/4" / 47-3/4" or 41-1/2"
36-1/4" or 30" / 53" or 46-3/4"
34" or 27-3/4" / 50-3/4 or 44-1/2"
LO 30-1/2" to HI 18-3/4" / LO 47-1/2" to HI 35-3/4"
LO 30-1/2" to HI 20-3/4" / LO 47-1/2" to HI 37-1/4"
LO 24-1/4" to HI 36"
Full One-Year SleepSafe Bed Warranty:The SleepSafe Bed is warranted against defects in workmanship or materials for a period of one year from the date of purchase. Sleep Safe Beds, LLC will repair or replace any defective part at no cost to the purchaser if the shipping of the part is within the continental United States. Limited Five Year SleepSafe Bed Warranty: During the second through fifth years from the date of purchase, SleepSafe Beds, LLC will replace any part found to be defective. Purchaser shall pay all service and shipping costs related to the replacement of the defective part. Terms and Conditions for SleepSafe Bed Warranty: A SleepSafe Bed is expressly prescribed for a single user. This warranty will cover the bed for this user only. Warranty coverage beyond this use is handled on a case by case basis. This warranty applies to normal use and does not cover any damage caused by excessive wear, abuse, misuse, mishandling or modification of the product. SleepSafe Bed Mattress Warranty Information: All SleepSafe Bed models are shipped with a CertiPUR-US memory foam mattress with gel infused technology. This support surface provides optimized pressure redistribution rapid heat dissipation and increases in breathablity compared to standard foam. Memory foam infused with gel polymers is designed for patient comfort as well as clinical superiority. Benefits include: reduced incidence of pressured ulcers by channeling heat away from the body significantly faster than standard foam, virtually eliminating perspiration moisture. The mattresses are water resistant, but are not waterproof. Full One-Year Warranty for SleepSafe Bed Mattress: Full one year warranty from date of purchase. SleepSafe Beds, LLC will replace the mattress due to a defect in the materials and workmanship of the mattress, at no cost to the purchaser. Limited Five Year Warranty for SleepSafe Bed Mattress: During the second to fifth year, SleepSafe Beds, LLC will replace the mattress due to a defect in the materials or workmanship of the mattress, with the shipping costs to be paid by purchaser. Terms and Conditions for SleepSafe Bed Mattress: Warranty Any breakdowns or deterioration of the product caused by factors other than a defect in the materials and workmanship of the mattress, such as repeated exposures to bodily fluids by incontinence, are not covered by this warranty. Note: Any modification to the product or its components will void the warranty and render the product incapable of fulfilling its intended purpose.